The Los Angeles County Board of Supervisors wrote a letter to Gov. Jerry Brown on Tuesday blasting the California Department of Toxic Substances Control for slow progress in testing and cleaning up lead-contaminated soil at dozens of homes near a troubled battery recycling plant in Vernon. The letter, signed by the countyâ€™s five supervisors, asks the governor to intervene with state environmental regulators to ensure the cleanup of all 39 homes where elevated levels of lead were detected in the soil last fall near the Exide Technologies plant. 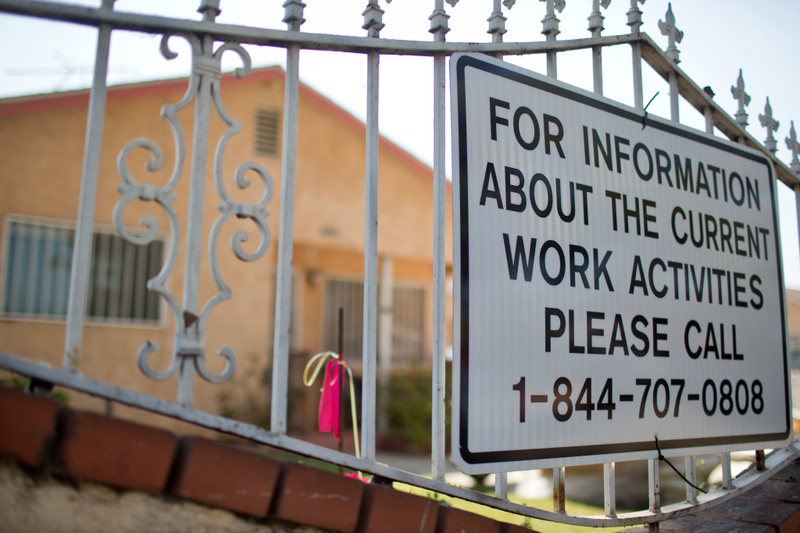 The request comes a day after crews hired by Exide began work to replace the soil at only two homes near the facility that had the highest concentrations of lead. That has angered community activists and environmental groups who say hundreds of surrounding homes may also be at risk from the harmful metal. County supervisors said cleanups of the remaining 37 homes in Boyle Heights and Maywood may not begin until at least October because Exide has not yet agreed to comply with directives the state toxics department issued in March. Supervisor Gloria Molina, whose district includes the Vernon plant, made the motion to prepare the letter, which was approved during a meeting of the board Tuesday. In a written statement, Molina said it was â€œoutrageous and unacceptableâ€ that the department has committed to clean only two out of 39 homes. â€œInstead of championing environmental justice for communities heavily burdened by pollution from facilities like Exide, DTSC has been the greatest roadblock to progress,â€ Molinaâ€™s statement said. In the letter, supervisors asked the governor to guarantee state funding for additional testing in the yards and interiors of homes near the plant to ensure the most contaminated properties are cleaned up without delay. Supervisors also sought a review of actions that have allowed Exide to operate for decades without a full permit from state toxic waste regulators and of â€œthe inadequate oversight which has failed to prosecute serious violations committed by Exide,â€ among other requests. The lead acid battery smelter, which has operated since 1922 and was acquired by Exide in 2000, has been cited repeatedly in recent years for emitting too much lead. State regulators believe the contamination at nearby homes is the result of air pollution from the plant depositing in the soil over many years. The state toxics department said it would review the letter. The toxics department also moved this week to expand testing to at least 144 more homes over two square miles of southeast Los Angeles County, an area where more than 60,000 people live. The Vernon facility, which is closed temporarily under an agreement with the South Coast Air Quality Management District, is one of only two lead acid battery smelters west of the Rocky Mountains. The plant has provoked community outrage since an air district report last year found the facilityâ€™s arsenic emissions posed an unacceptable cancer risk to 110,000 people. All five members of the Los Angeles County Board of Supervisors have signed a letter imploring California Gov. Jerry Brown to intervene in the stateâ€™s handling of contamination around the Exide Technologies plant in Vernon. The letter criticizing the stateâ€™s â€œpiecemeal approach to an urgent environmental hazardâ€ comes as workers paid for by Exide are removing lead-contaminated topsoil from two homes near the intersection of Olympic and Indiana avenues in L.A. The supervisors also say the state has â€œrenegedâ€ on its commitments to test for lead inside the homes as well as outside. The Department of Toxic Substances Control says that the two homes workers are at this week will be cleaned inside and out â€” even without indoor testing. Â The DTSCâ€™s Rizgar Ghazi said Monday that crews will use HEPA filters, vacuums and shampooing equipment on â€œbasically any flat surfaceâ€ inside the two residences.